In the fall of 1848, Captain Justice Bailey encountered a fierce October storm while traversing the Eastern Shore of the peninsula, and carrying a full complement of passengers, decided to seek shelter from the worsening storm. Pulling into a sheltered bay, and dropping anchor to ride out the storm, the Captain took the opportunity to explore some of the shore. Finding limestone, pine, maple and beech trees, Bailey reported his discovery to Mr. Alanson Sweet, the owner of the shipping company for whom Bailey was employed. In 1849, Sweet sent a crew to the Harbor to construct a pier, sawmill, quarry and group of houses for his workers. That winter 2,500 cords of lumber were shipped from the harbor. Sweet managed to convince the State Legislature that Bailey’s Harbor was destined to grow, and the village was named as the County Seat. Sweet then petitioned the Federal Government for the construction of a lighthouse to assist vessels making their way into the harbor. Congress responded favorably and awarded Sweet the contract to build the lighthouse. Selecting a one thousand foot by two hundred and fifty foot island as the best location for the tower, Sweet’s crew began construction in 1852. With lake levels extremely low that year, they were able to transport all the building materials directly to the island. 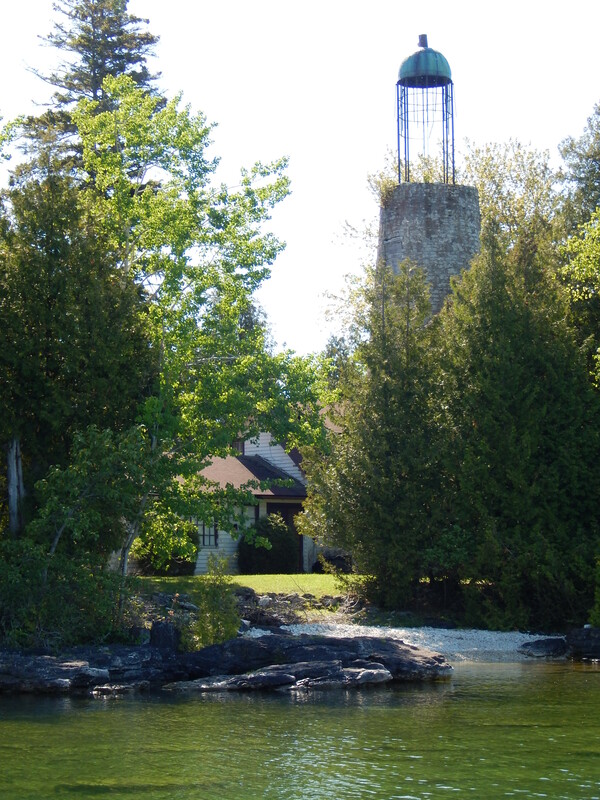 Built of native stone from Sweet’s quarry, the fifty-two foot tower was capped with a birdcage-style lantern room, and equipped with a fixed white Sixth Order Fresnel lens. As was usual in lantern rooms of this style, the lens was supported in the center of the tower with no platform or catwalk surrounding the lantern room. The lens was later upgraded to a fixed white Fifth Order Fresnel in 1858. As a result of significant deterioration, in 1866 the Lighthouse Board recommended that the light be rebuilt, and $15,000 was appropriated for the project. However, at the last minute, it was determined that the harbor would be better served through the construction of range lights on the west shore, and the coastline would be better served through the construction of a light on Cana Island. Thus the decision was made to abandon the light as soon as the range lights were constructed. At the close of the shipping season on December 1, 1869 the light was displayed for the last time, and the station closed. At some time thereafter, the island was sold into private ownership.